A newly added product category for Mettler Electronics advances the fight against pain using a therapeutic infrared laser that directs pain–relieving light deep into tissues. Super luminous diodes are also available to treat larger areas with soothing infrared light. Both forms of light energy produce temporary increases in blood circulation, temporary relief of minor muscle and joint aches, pains and stiffness, relaxation of muscles and temporary relief of minor pain and stiffness associated with arthritis. You can add full-featured light therapy capabilities to the Sys*Stim 240 by purchasing the laser/cluster, laser or cluster applicator package. The laser applicator has a 80 mW, 785 nm laser diode and the cluster emits 500 mW at 600 and 950 nm. Applicator holders are provided with each applicator and can be attached to the sides of the Sys*Stim 240. 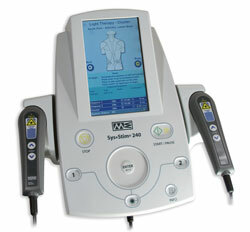 The Sys*Stim 240 has all the hardware and software already installed to perform light therapy, including protocols. © 2019 Source Ortho. All Rights Reserved.